Haq's Musings: Will America Doom Sharif? Alarmed by the recent Taliban gains in Pakistan and President Zardari's apparent appeasement of them, the United States is now contemplating an alliance with Mian Nawaz Sharif to bolster its anti-terror efforts in the region. According to the Wall Street Journal, "U.S. and European officials now believe Mr. Sharif's long ties to Islamist political parties and leaders could position him better to convince the Pakistani public of the need to confront the Taliban." Maj. Gen. Athar Abbas, chief military spokesman, has acknowledged the lack of popular support as a reason for the military's inability or unwillingness to confront the growing Taliban threat in Pakistan. Earlier this week, he reportedly told the press, "We need public support to fight militants." Less than half of the population in the North-West Frontier Province (NWFP) and Balochistan think that the government should take a tougher stance on ridding Pakistan of terrorist activities, according to a Gallup poll conducted late last year. Overall, sixty percent of Pakistani nationals are of the view that the government should take a tougher approach to rid the country of terrorist activities, the poll said. After years of shunning Mr. Nawaz Sharif as an Islamist, the United States opened dialogue with the PML chief when Secretary of State Hillary Clinton spoke to him to defuse the political crisis stemming from the dismissal of Sharif's Punjab government last month. 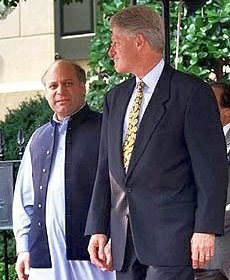 Clinton found Sharif receptive and the talks have yielded closer ties between the Obama administration and the PML leader. Following this very overt intervention in the internal politics of Pakistan, Clinton said the Obama administration would continue to work with the Pakistani leaders. "We are going to continue our very close working relationship with the government and a number of Pakistani leaders in the days and weeks ahead," she said. Since March, Mr. Zardari has been losing his popularity in the country and the US now believes he can no longer deliver on his commitments to the US. On the other hand, Mr. Nawaz Sharif's stature has risen both nationally and internationally. Sharif's change of heart to lean against the Taliban may have its origins in the fear of the Taliban felt by his constituents in the Punjab as well as pressure from Pakistan's closest allies in Riyadh and Beijing. According to media reports, China and Saudi Arabia, have strongly indicated to Pakistan's leadership that its continuing tolerance of the Taleban and al-Qaeda on its soil is endangering the national security of these two countries. While there are no US plans afoot to remove Mr. Zardari, there is plenty of talk about weakening his office through repeal of the 17th amendment in Pakistan's constitution that gives the president the power to dismiss the elected government and legislature. Such a move will potentially open the way for Nawaz Sharif to emerge as Pakistan's powerful prime minister to succeed Mr. Yousuf Raza Gilani who is generally perceived as weak and indecisive. As the US considers its policy shift to favor Sharif in Pakistan, the Taliban have begun to target the landed elite as a winning strategy. They have latched on to a cause that appeals to the common rural folks in Pakistan's largely feudal society in which most of the political power is concentrated in a few dozen big landowning families. The Taliban are pursuing their campaign with a revolutionary zeal. Like Hizbullah in Lebanon and Google in Silicon Valley, it seems to me that the Taliban play their own game by their own rules. They are very focused, extremely nimble and highly adaptive, and they know how to raise money, as well as any Silicon Valley startup. They have mastered the art of "disruption" and "change". And they appear to have the upper hand at the moment. Given the underlying and growing resentment against the feudal/tribal power of a narrow and corrupt ruling elite in Pakistan, it appears that Swat represents only the beginning of a bloody revolt in the rest of the country. If the reports of US-Sharif alliance prove to be accurate and Sharif does emerge as Pakistan's next prime minister, it is important for both the US officials and Nawaz Sharif to recognize that any hint of Sharif acting on behalf of the US agenda will backfire. And the potential Sharif government will meet the same fate as governments of Musharraf and Zardari in terms of loss of credibility with the people of Pakistan. Even more importantly, if the US does succeed in forcing General Kayani and the Pakistani army to do things that their soldiers detest, as Adm Mike Mullen has been trying to do, it may destroy the army. This would be a catastrophe for the US that would dwarf even defeat in Afghanistan. While continuous behind-the-scenes pressure on Pakistan may work, the use of America's soft power is much more likely to be effective with Pakistanis. Beyond the efforts to create and fund reconstruction opportunity zones (ROZ) in FATA which are desirable and welcome, what is really needed is an international Marshall Plan style effort toward transforming Pakistan from a feudal/tribal to an industrial society which can employ its growing young population. Pakistan's President Zardari has called for such a Marshall Plan for Pakistan. Such an effort will face major hurdles from Zardari's own party and its corrupt feudal leadership. However, if it is successfully implemented to respond to mounting pressure by the Taliban, new opportunities will open up for the nation's young population to offer them better alternatives to joining Jihadi outfits or seeking work in countries like Saudi Arabia where they are further radicalized. Although the Taliban are primarily a rural, northwestern frontier movement, it is becoming increasingly clear that their sympathizers are found in all parts of Pakistan in varying numbers. If Taliban do succeed in making substantial gains in the North, no part of Pakistan will be immune...they will particularly commit major high-profile acts of terror in all major urban centers as they have in Lahore and Islamabad recently. I think the urban middle class in Pakistan in all parts of the country should recognize this menace and organize themselves to resists the seemingly inevitable Taliban urban onslaught.